National tragedy usually sparks the need to dramatize events so that we never forget. 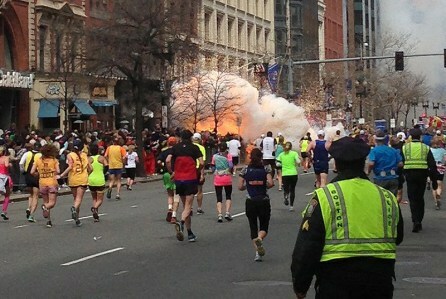 In director Peter Berg's new thriller it recreates the horrific bombing that occurred during the 2013 Boston Marathon. There were three proposed stories in which two of them were combined, one based on the book Boston Strong by Casey Sherman and Dave Wedge. The screenplay was written by Berg, Matt Cook and Joshua Zeturner is part documentary, police procedural and patriotic grandstanding. Its an unabashed love letter to the first responders, the challenge of the law enforcers to work quickly despite the lack of information and differing methods and the cooperation of the people of the Boston area. Mark Wahlberg plays the fictional Tommy Saunders to represent the everycop of the Boston Police. He's loud and brash, the stereo typical Masshole as they are known in the area. He's been sort of suspended due to his volatile character. John Goodman playing the real life Boston Police Commissioner Ed Davis, asks him to monitor the end of the race in order to get his job back. Real life James Colby, the Boston Police Superintendent is played by William Evans. The beginning of the film starts slow and introduces you to the various people affected by the bombing from the victims to the weed smoking dorm mates, to the culprits. No real reason for the attack is explored out side of the older brother Tamerian Tsarnaev (Themo Melikdze) who is heavily accented and the mastermind and younger brother Dzhokhar (Alex Wolff) is more assimilated and a college student are building bombs in their apartment while watching the news. The disjointed snippets also lets us see the life of Dun Meng (Jimmy Yang) who was hijacked by the Tsarnaevs. There is also the Watertown Police Sergeant Jeffrey Pugliese played by J.K. Simmons who helped bring down one of the bombers. The film also honors the Officer Sean Collier (Jake Picking) who was killed by the Tsarnaevs a couple days later. Eventually these little emotional moments are united to fuel the urgency and outrage to bring the bad guys to justice. Wahlberg does a good job does a good job conveying the shock at the chaos and havoc right after the bombs go off, then the anger and determination. Wahlberg, pretty much plays Wahlberg no matter what movie with the same toughness and tenderness with a brash, snarky attitude. FBI agent Richard DesLauriers (Kevin Bacon), Massachusetts Governor Deval Patrick (Michael Beach) and Boston Mayor Thomas Menino (Vincent Curatola) and the Boston Police clash egos and opinions as they investigate. FBI headquarters set up in a empty warehouse study the street cameras, and everyone's cell phones for clues. Once the brother's are picked out of the crowd, the action ramps up as the police close in and the random chain of events results in a shootout with police and bombs in the quiet Watertown neighborhood. The decision to put the city on lockdown to find the younger brother reminds everyone that Boston united together to help make Boston Strong.